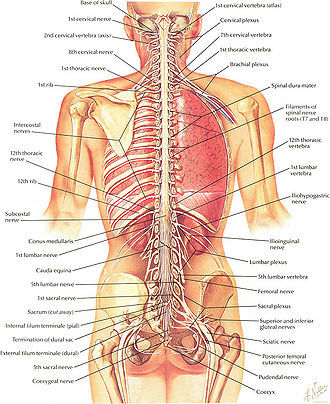 The spinal cord is the long, tubular structure in vertebrates that consists of a bundle of nervous tissue and support cells, connects with the brain, and extends lengthwise down the spinal cavity within the vertebral column (spine); together, the brain and the spinal cord comprise the central nervous system of vertebrates. Both the brain and the spinal cord develop from the embryonic feature known as the dorsal nerve cord. The spinal cord functions primarily in the transmission of neural signals between the brain and the rest of the body (motor and sensory information, traveling in opposite directions down the spinal cord). However, the spinal cord also contains neural circuits that can independently coordinate numerous reflexes, which are automatic responses to various stimuli (such as pulling hand back from a hot object before the brain has processed the information). The human spinal cord is elastic, and well protected by bone, cerebrospinal fluid, and meninges. But this intricate structure, which is part of the most complex object known to science (the human nervous system), can also suffer devastating injury. Severe damage can result in paralysis and poliomyelitis results from a viral inflammation of the spinal cord’s gray matter. Injuries to the spinal cord have been discussed in writing as far back as the Edwin Smith Papyrus several thousand years ago and such famous cases of injury have included Lord Nelson, General George Patton, politician George Wallace, and U.S. President James Garfield, as well as actor Christopher Reeve, who was left a quadriplegic after being thrown by a horse. Much current research is focused on finding solutions to spinal cord injuries, including stimulating regrowth of axons, replacing damaged nerve or glial cells, and retraining the circuits. An animal's nervous system is that network of specialized cells, tissues, and organs that coordinates the body's interaction with the environment, such as sensing the environment, monitoring organs, and coordinating the activity of muscles. All parts of the nervous system are made of nervous tissue, which conducts electrical impulses. Prominent components in a vertebrate nervous system are neurons (nerve cells) and nerves. Neurons are typically composed of a soma, or cell body, a dendritic tree, and an axon. What are commonly called nerves are actually bundles of axonal processes of nerve cells. The nervous system of vertebrate animals is divided into the central nervous system (CNS) and the peripheral nervous system (PNS). The central nervous system is that portion of the vertebrate nervous system that is composed of the brain and spinal cord. The peripheral nervous system consists of the nerves and neurons that reside or extend outside the central nervous system, such as to serve the limbs and organs. 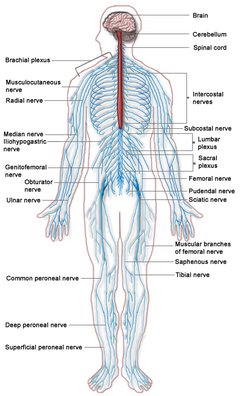 The large majority of what are commonly called nerves are considered to be PNS. The CNS is contained within the dorsal cavity, with the brain in the cranial subcavity (the skull), and the spinal cord in the spinal cavity (within the vertebral column). The nerves that pass through the spinal cord, and nerves from the PNS, provide sensory input to the brain, which processes the information and initiates responses. The spinal cord serves as the main route for the movement of sensory information to and from the brain. Information flows to the CNS from the PNS, which senses the internal and external environment, and the response of the brain flows to the various organs and tissues by means of the spinal cord nerve network (Chamberlin and Narins 2005). All vertebrates have a spinal cord. The spinal cord and brain develop from the embryonic dorsal nerve cord. The dorsal nerve cord itself develops from a plate of dorsal ectoderm that invaginates into a hollow, fluid-filled tube. Essentially, the neural tissue, which concentrates above the developing notochord on the embryo's outer surface, folds into a hollow, neural tube, and then sinks to arrive at its internal position (Campbell et al. 2013). The spinal cord runs along the dorsal side of the vertebrate body, above the gut, unlike the ventral nerve cord of invertebrates, which is usually positioned on the ventral side, below the gut, and likewise is solid, not hollow and fluid-filled. In humans, the spinal cord begins at the occipital bone and extends down to the space between the first and second lumbar vertebrae; it does not extend the entire length of the vertebral column. It is around 45 cm (18 in) in men and around 43 cm (17 in) long in women. Also, the spinal cord has a varying width, ranging from 1/2 inch thick in the cervical and lumbar regions to 1/4 inch thick in the thoracic area. The enclosing bony vertebral column protects the relatively shorter spinal cord. Both the spinal cord and the brain contain white matter and gray matter. Spinal and cerebral white matter do not contain dendrites, which can only be found in gray matter. Dendrites are branched projections of a neuron that act to conduct the electrical stimulation received from other neural cells to the cell body. Gray matter contains dendrites, along with neural cell bodies and shorter, unmylinated axons. White matter consists of axons with myelinated and unmyelinated sheaths, with the myelinated sheaths (i.e., coated by myelin) creating the white appearance. Generally, white matter can be understood as the parts of the brain and spinal cord responsible for information transmission (axons); whereas, gray matter is mainly responsible for information processing (neuron bodies). In the human spinal cord, the axons coated with myelin are on the surface and the axon-dendrite networks are on the inside, while in the brain this is reversed (i.e, in the spinal cord, white matter is on the outside, while it is predominately on the inside in the brain (Chamberlin and Narins 2005; Campbell et al. 2008; Marieb and Hoehn 2010). Glial cells, or glia, are supporting cells that assist the functioning of neurons, including providing nourishment, insulation of the axons, and regulation of the extracellular fluid. Those present in the spinal cord include such as astrocytes, which provide structural support for the neurons and regulation of the concentrations of ions and neurotransmitters in the extracellular environment, and radial glia that are important in the development of the nervous system. Both types of glia also can serve as stem cells for the generation of neurons and more glia (Campbell 2008). The spinal cord has three major functions: as a conduit for motor information, which travels down the spinal cord; as a conduit for sensory information in the reverse direction; and finally as a center for coordinating certain reflexes (Maton et al. 1993). The spinal cord is the main pathway for information connecting the brain and peripheral nervous system. It is housed and protected in the spinal canal by the vertebral column, also known as backbone or spine, which is situated in the dorsal aspect of the torso. In all animals, vertebrae are defined by the regions of the vertebral column they occur in. 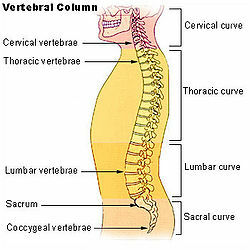 Viewed laterally, the vertebral column of humans presents several curves, which correspond to the different regions of the column. The curves are called cervical curve, thoracic curve, lumbar curve, and sacral curve. Cervical vertebrae are those in the neck area. The dorsal vertebrae, which range from the bottom of the neck to the top of the pelvis, are called thoracic vertebrae when attached to ribs, while those without ribs are called lumbar vertebrae. The sacral vertebrae are those in the pelvic region. Below the sacral vertebrae are the coccygeal vertebrae. In human anatomy, the vertebral column normally consists of thirty-three (33) vertebrae: 24 articulating vertebrae and 9 fused vertebrae in the sacrum and the coccyx (five that are fused to form the sacrum and four coccygeal bones that form the tailbone). The 24 articulating vertebrae include 7 cervical vertebrae), 12 thoracic vertebrae, and 5 lumbar vertebrae. This number is sometimes increased by an additional vertebra in one region, or it may be diminished in one region, the deficiency often being supplied by an additional vertebra in another. The vertebral column (bones) that supports the spinal cord is about 70 cm long. The length of the spinal cord in humans is much shorter than the length of the bony spinal column. The human spinal cord extends from the foramen magnum and continues through to the conus medullaris near the second lumbar vertebra, terminating in a fibrous extension known as the filum terminale. It averages about 45 cm (18 in) long in men and around 43 cm (17 in) in women. Cervical enlargement. The cervical enlargement corresponds roughly to the brachial plexus nerves, which innervate the upper limb. It includes spinal cord segments from about C3 to T2. The corresponding vertebral levels of the enlargement are roughly the same. The cervical enlargement is where sensory input comes from and motor output goes to the arms. Lumbosacral enlargement. The lumbar enlargement or lumbosacral enlargement corresponds to the lumbosacral plexus nerves, which innervate the lower limb. It commences about the level of T11, and reaches its maximum circumference, of about 33mm., at L1 (lumbar vertebra), below which it tapers rapidly into the conus medullaris. The lumbar enlargement handles sensory input and motor output coming from and going to the legs. The spinal cord can be anatomically divided into 31 spinal segments based on the origins of the spinal nerves. That is, although the spinal cord actually is continuous throughout its length, there are 31 pairs of spinal nerves attached to the cord, by paired roots (a pair of dorsal and ventral nerve roots for each segment), and these attachments are used to define segments. These nerves exit the vertebral column and travel to the particular body region being served (Marieb and Hoehn 2010). Numbering of the spinal cord is relative to the vertebral segments where they exit. Spinal nerves pass through the vertebral column by exiting superior to their corresponding vertebrae via the intervertebral foramen. However, because the spinal cord does not reach the end of the vertebral column, the lumbar and sacral spinal nerves exit only by first going downward and traveling inferiorly through the vertebral canal before reaching their corresponding intervertebral foramina. For this reason, there is a collection of nerve roots at the lower end of the vertebral canal. This collection of nerve roots is called the cauda equina due to a resemblance to a horse's tail (Marieb and Hoehn 2010). 3 coccygeal segments joined up becoming a single segment forming 1 pair of coccygeal nerves (exit spinal column through the sacral hiatus). Note that although this lists 33 segments (as with the 33 vertebra), the 3 coccygeal segments join up to form 1 pair of coccygeal nerves, becoming a single segment and giving 31 spinal cord segments. At every spinal cord segment, right and left pairs of spinal nerves (mixed; sensory and motor) form. Six to eight motor nerve rootlets branch out of right and left ventro lateral sulci in a very orderly manner. Nerve rootlets combine to form nerve roots. Likewise, sensory nerve rootlets form off right and left dorsal lateral sulci and form sensory nerve roots. The ventral (motor) and dorsal (sensory) roots combine to form spinal nerves (mixed; motor and sensory), one on each side of the spinal cord. In other words, the dorsal nerves exiting each spinal cord segment have sensory nerve fibers that carry incoming information from the body into the CNS; the ventral roots have motor or efferent nerves that take information from the CNS to control muscles and do such automatic functions as control of sweating and blood pressure). Spinal nerves, with the exception of C1 and C2, form inside intervertebral foramen (IVF). Note that at each spinal segment, the border between the central and peripheral nervous system can be observed. Rootlets are a part of the peripheral nervous system. As noted above, in the upper part of the vertebral column, spinal nerves exit directly from the spinal cord, whereas in the lower part of the vertebral column nerves pass further down the column before exiting, with this latter collection of nerves known as the cauda equina. 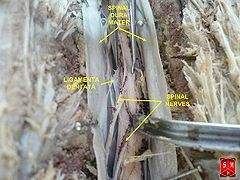 The cauda equina results from the fact that sacral spinal nerves actually originate in the upper lumbar region. The spinal cord has a shape that is compressed dorso-ventrally, giving it an elliptical shape. The cord has grooves in the dorsal and ventral sides. The posterior median sulcus is the groove in the dorsal side, and the anterior median fissure is the groove in the ventral side. The spinal cord is elastic and thus can stretch as the head or trunk turn. 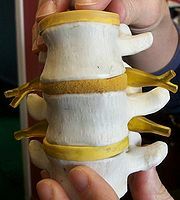 A model of segments of the human vertebral column, nerve roots can be seen extending laterally from the (not visible) spinal cord. The spinal cord is protected by three layers of tissue, called spinal meninges, that surround the canal. The dura mater is the outermost layer of protective tissue, and it forms a tough protective coating. Between the dura mater and the surrounding bone of the vertebrae is a space called the epidural space. The epidural space is filled with adipose tissue, and it contains a network of blood vessels. The arachnoid mater is the middle protective layer. Its name comes from the fact that the tissue has a spiderweb-like appearance. The space between the arachnoid and the underlying pia mater is called the subarachnoid space. The subarachnoid space contains cerebrospinal fluid (CSF). The medical procedure known as a lumbar puncture (or "spinal tap") involves use of a needle to withdraw cerebrospinal fluid from the subarachnoid space, usually from the lumbar region of the spine. The pia mater is the innermost protective layer. It is very delicate and it is tightly associated with the surface of the spinal cord. The cord is stabilized within the dura mater by the connecting denticulate ligaments, which extend from the enveloping pia mater laterally between the dorsal and ventral roots. The dural sac ends at the vertebral level of the second sacral vertebra. Each segment of the spinal cord is associated with a pair of ganglia, called dorsal root ganglia, which are situated just outside of the spinal cord. These ganglia contain cell bodies of sensory neurons. Axons of these sensory neurons travel into the spinal cord via the dorsal roots. Ventral roots consist of axons from motor neurons, which bring information to the periphery from cell bodies within the CNS. Dorsal roots and ventral roots come together and exit the intervertebral foramina as they become spinal nerves. The spinal cord and brain develop from the embryonic dorsal nerve cord, which itself develops from dorsal ectoderm. The neural tissue gathers on the outer surface of the embryo, folds into a hollow, fluid-filled tube, and then the tube sinks to arrive at its internal position (Campbell et al. 2013). The spinal cord is made from caudal part of the embryonic neural tube. As the neural tube begins to develop, the notochord begins to secrete a factor known as Sonic hedgehog or SHH. As a result, the floor plate then also begins to secrete SHH, and this will induce the basal plate to develop motor neurons. Meanwhile, the overlying ectoderm secretes bone morphogenetic protein (BMP). This induces the roof plate to begin to secrete BMP, which will induce the alar plate to develop sensory neurons. The alar plate and the basal plate are separated by the sulcus limitans. Additionally, the floor plate also secretes netrins. The netrins act as chemoattractants to decussation of pain and temperature sensory neurons in the alar plate across the anterior white commissure, where they then ascend towards the thalamus. Essentially, by the sixth week of the human embryo's development, two clusters of neuroblasts are recognizable on each side of the neural tube, a ventral basal plate and a dorsal alar plate. The basal plate neuroblasts give rise to motor neurons and axons that grow to the effector organs, while the alar plate neuroblasts become interneurons. The emerging axons from the alar plate cells, as well as from some basal plate cells, become the white matter of the spinal cord, as the grow along the cord's length. These two plates will further expand ventrally and dorsally to produce the H-shaped gray matter (Marieb and Hoehn 2010). Lastly, it is important to note that the past studies of Viktor Hamburger and Rita Levi-Montalcini in the chick embryo have been further supported by more recent studies which demonstrated that the elimination of neuronal cells by programmed cell death (PCD) is necessary for the correct assembly of the nervous system. The spinal cord is supplied with blood by three arteries that run along its length starting in the brain, and many arteries that approach it through the sides of the spinal column. The three longitudinal arteries are called the anterior spinal artery, and the right and left posterior spinal arteries (Moore and Agur 2007). These travel in the subarachnoid space and send branches into the spinal cord. They form anastamoses (connections) via the anterior and posterior segmental medullary arteries, which enter the spinal cord at various points along its length (Moore and Agur 2007). The actual blood flow caudally through these arteries, derived from the posterior cerebral circulation, is inadequate to maintain the spinal cord beyond the cervical segments. The major contribution to the arterial blood supply of the spinal cord below the cervical region comes from the radially arranged posterior and anterior radicular arteries, which run into the spinal cord alongside the dorsal and ventral nerve roots, but with one exception do not connect directly with any of the three longitudinal arteries (Moore and Agur 2007). These intercostal and lumbar radicular arteries arise from the aorta, provide major anastomoses and supplement the blood flow to the spinal cord. In humans, the largest of the anterior radicular arteries is known as the artery of Adamkiewicz, or anterior radicularis magna (ARM) artery, which usually arises between L1 and L2, but can arise anywhere from T9 to L5 (Biglioli et al. 2004). Impaired blood flow through these critical radicular arteries, especially during surgical procedures that involve abrupt disruption of blood flow through the aorta for example during aortic aneursym repair, can result in spinal cord infarction and paraplegia. Somatosensory organization is divided into the dorsal column-medial lemniscus tract (the touch/proprioception/vibration sensory pathway), and the anterolateral system, or ALS (the pain/temperature sensory pathway). Both sensory pathways use three different neurons to get information from sensory receptors at the periphery to the cerebral cortex. These neurons are designated primary, secondary, and tertiary sensory neurons. In both pathways, primary sensory neuron cell bodies are found in the dorsal root ganglia, and their central axons project into the spinal cord. In the dorsal column-medial leminiscus tract, a primary neuron's axon enters the spinal cord and then enters the dorsal column. If the primary axon enters below spinal level T6, the axon travels in the fasciculus gracilis, the medial part of the column. If the axon enters above level T6, then it travels in the fasciculus cuneatus, which is lateral to the fasiculus gracilis. Either way, the primary axon ascends to the lower medulla, where it leaves its fasiculus and synapses with a secondary neuron in one of the dorsal column nuclei: either the nucleus gracilis or the nucleus cuneatus, depending on the pathway it took. At this point, the secondary axon leaves its nucleus and passes anteriorly and medially. The collection of secondary axons that do this are known as internal arcuate fibers. The internal arcuate fibers decussate and continue ascending as the contralateral medial lemniscus. Secondary axons from the medial lemniscus finally terminate in the ventral posterolateral nucleus (VPL) of the thalamus, where they synapse with tertiary neurons. From there, tertiary neurons ascend via the posterior limb of the internal capsule and end in the primary sensory cortex. The proprioception of the lower limbs differs from the upper limbs and upper trunk. There is a four-neuron pathway for lower limb proprioception. This pathway initially follows the dorsal spino-cerebellar pathway. It is arranged as follows: proprioceptive receptors of lower limb -> peripheral process -> dorsal root ganglion -> central process -> Clarke's column -> 2nd order neuron -> medulla oblogata (Caudate nucleus) -> 3rd order neuron -> VPL of thalamus -> 4th order neuron -> posterior limb of internal capsule -> corona radiata -> sensory area of cerebrum. The anterolateral system works somewhat differently. Its primary neurons axons enter the spinal cord and then ascend one to two levels before synapsing in the substantia gelatinosa. The tract that ascends before synapsing is known as Lissauer's tract. After synapsing, secondary axons decussate and ascend in the anterior lateral portion of the spinal cord as the spinothalamic tract. This tract ascends all the way to the VPL, where it synapses on tertiary neurons. Tertiary neuronal axons then travel to the primary sensory cortex via the posterior limb of the internal capsule. It should be noted that some of the "pain fibers" in the ALS deviate from their pathway towards the VPL. In one such deviation, axons travel towards the reticular formation in the midbrain. The reticular formation then projects to a number of places including the hippocampus (to create memories about the pain), the centromedian nucleus (to cause diffuse, non-specific pain), and various parts of the cortex. Additionally, some ALS axons project to the periaqueductal gray in the pons, and the axons forming the periaqueductal gray then project to the nucleus raphes magnus, which projects back down to where the pain signal is coming from and inhibits it. This helps control the sensation of pain to some degree. 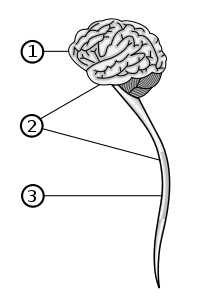 Cortical upper motor neurons originate from Brodmann areas 1, 2, 3, 4, and 6 and then descend in the posterior limb of the internal capsule, through the crus cerebri, down through the pons, and to the medullary pyramids, where about ninety percent of the axons cross to the contralateral side at the decussation of the pyramids. They then descend as the lateral corticospinal tract. These axons synapse with lower motor neurons in the ventral horns of all levels of the spinal cord. The remaining ten percent of axons descend on the ipsilateral side as the ventral corticospinal tract. These axons also synapse with lower motor neurons in the ventral horns. Most of them will cross to the contralateral side of the cord (via the anterior white commissure) right before synapsing. The midbrain nuclei include four motor tracts that send upper motor neuronal axons down the spinal cord to lower motor neurons. These are the rubrospinal tract, the vestibulospinal tract, the tectospinal tract, and the reticulospinal tract. The rubrospinal tract descends with the lateral corticospinal tract, and the remaining three descend with the anterior corticospinal tract. The anterior corticospinal tract descends ipsilaterally in the anterior column, where the axons emerge and either synapse on lower ventromedial (VM) motor neurons in the ventral horn ipsilaterally or descussate at the anterior white commissure where they synapse on VM lower motor neurons contralaterally . The tectospinal, vestibulospinal, and reticulospinal descend ipsilaterally in the anterior column but do not synapse across the anterior white commissure. Rather, they only synapse on VM lower motor neurons ipsilaterally. The VM lower motor neurons control the large, postural muscles of the axial skeleton. These lower motor neurons, unlike those of the DL, are located in the ventral horn all the way throughout the spinal cord. Proprioceptive information in the body travels up the spinal cord via three tracts. Below L2, the proprioceptive information travels up the spinal cord in the ventral spinocerebellar tract. Also known as the anterior spinocerebellar tract, sensory receptors take in the information and travel into the spinal cord. The cell bodies of these primary neurons are located in the dorsal root ganglia. In the spinal cord, the axons synapse and the secondary neuronal axons decussates and then travel up to the superior cerebellar peduncle where they decussate again. From here, the information is brought to deep nuclei of the cerebellum including the fastigial and interposed nuclei. Motor information travels from the brain down the spinal cord via descending spinal cord tracts. Descending tracts involve two neurons: the upper motor neuron (UMN) and lower motor neuron (LMN) (Saladin 2010). A nerve signal travels down the upper motor neuron until it synapses with the lower motor neuron in the spinal cord. Then, the lower motor neuron conducts the nerve signal to the spinal root where efferent nerve fibers carry the motor signal toward the target muscle. The descending tracts are composed of white matter. There are several descending tracts serving different functions. The corticospinal tracts (lateral and anterior) are responsible for coordinated limb movements (Saladin 2010). Although elastic and protected by the bone of the vertebral column and by meninges and cerebrospinal fluid, the spinal cord also is sensitive to direct pressure. Damage to the cord or its roots can result in functional loss, including sensory loss (parasthesias) and loss of motor function (paralysis). Among the types of paralysis are flaccid paralysis, when there is severe damage to the ventral root (or ventral horn cells) and nerve impulses do not reach their corresponding muscles, causing loss of their voluntary or involuntary movement, and spastic paralysis, when the upper motor neurons of the primary motor cortex are damaged in such a way that the muscles are stimulated irregularly by spinal reflex activity (Marieb and Hoehn 2010). Damage to upper motor neuron axons in the spinal cord results in a characteristic pattern of ipsilateral deficits. These include hyperreflexia, hypertonia, and muscle weakness. Lower motor neuronal damage results in its own characteristic pattern of deficits. Rather than an entire side of deficits, there is a pattern relating to the myotome affected by the damage. Additionally, lower motor neurons are characterized by muscle weakness, hypotonia, hyporeflexia, and muscle atrophy. Spinal cord injury can also be non traumatic and caused by disease (transverse myelitis, polio, spina bifida, Friedreich's ataxia, spinal cord tumor, spinal stenosis, etc.). In poliomyelitis, spinal cord inflammation results from the ventral horn motor neurons being destroyed by the poliovirus (Marieb and Hoehn 2010). Lou Gehrig's disease (amyotrophic lateral sclerosis) is caused by a progressive destruction of the ventral horn motor neurons (Marieb and Hoehn 2010). Biglioli, P., M. Roberto, A. Cannata, et. al. 2004. Upper and lower spinal cord blood supply: The continuity of the anterior spinal artery and the relevance of the lumbar arteries. Journal of Thoracic and Cardiovascular Surgery 127(4): 1188–1192. PMID 15052221. Retrieved July 4, 2013. Maton, A., J. Hopkins, C. W. McLaughlin, S. Johnson, M. Q. Warner, D. LaHart, and J. D. Wright. 1993. Human Biology and Health. Englewood Cliffs, NJ: Prentice Hall. ISBN 0139811761. Moore, K., and A. Agur. 2007. Essential Clinical Anatomy, Third Edition. Lippincott Williams & Wilkins. ISBN 078176274X. Saladin, K. S. 2010. Anatomy & Physiology: The Unity of Form and Function, 5th edition. Dubuque: McGraw-Hill. ISBN 0073525693. Spinal Cord Histology - A multitude of great images from the University of Cincinnati. Spinal Cord Medical Notes - Online medical notes on the spinal cord. The Nervous System: Sensory and Motor Tracts of the Spinal Cord. Napa Valley College/Southeast Community College Lincoln, Nebraska. This page was last modified on 10 May 2014, at 15:39.